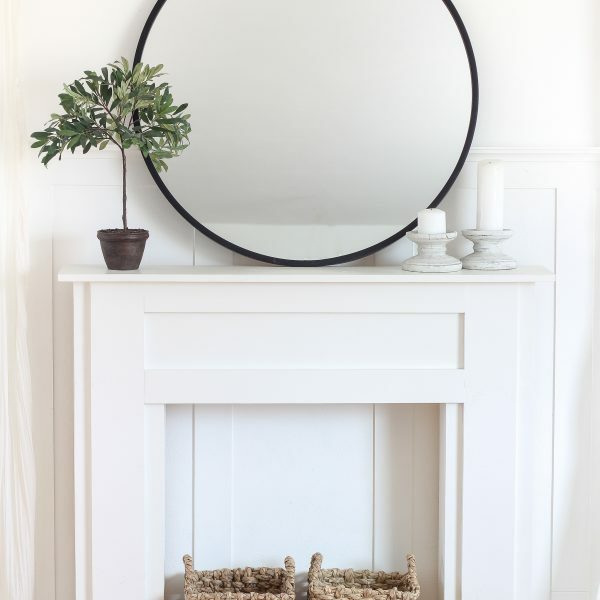 Want a unique piece of decor that will add tons of character to a room? 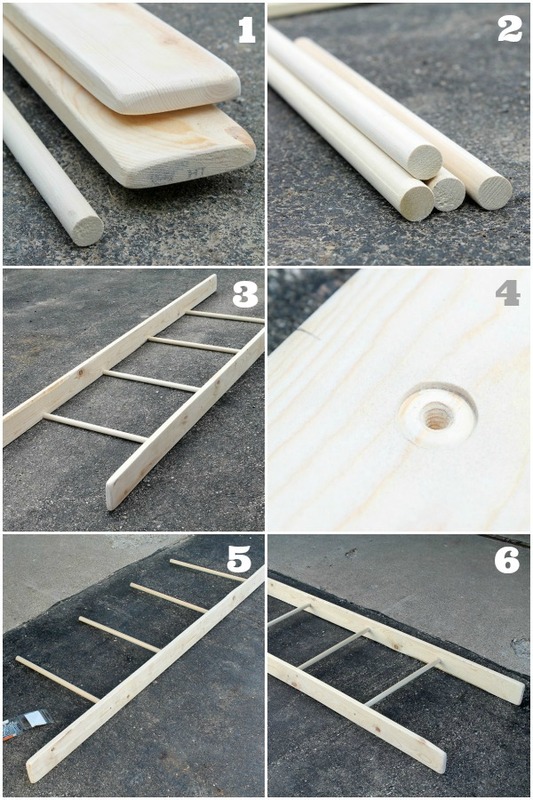 Learn how to build your own ladder with this simple, step-by-step tutorial! I am SO excited to show you guys this project!! I have been pretty proud of some of my past DIY builds, but for some reason this one tops my list… I built a ladder. 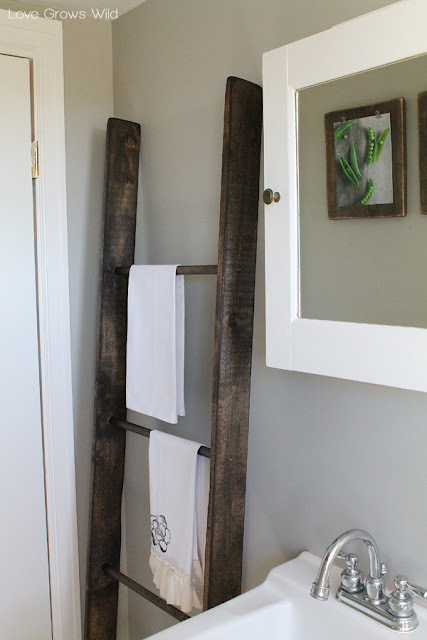 And not just any ladder, but a rustic, decorative, hold-my-pretty-towels kind of ladder! 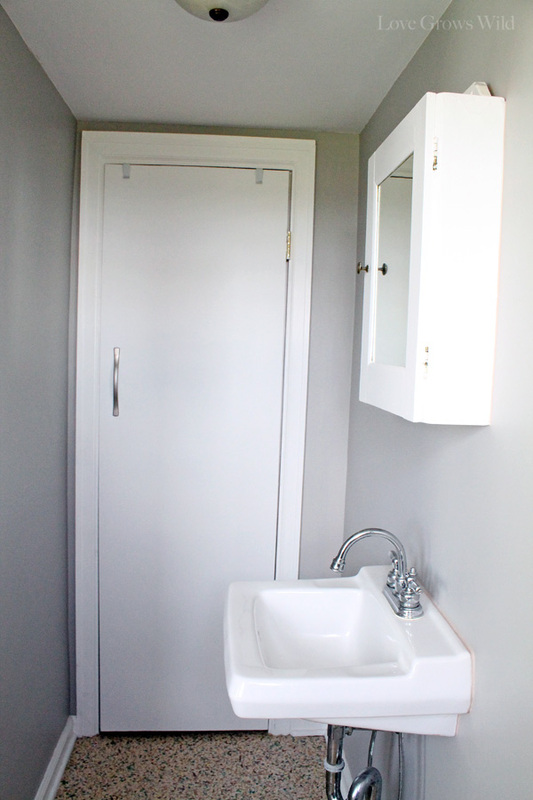 Next to our pantry we have this cute little wash sink, and I’ve never really known what to do with it. There’s not a lot of space, so my decorating options are pretty limited. Right now we don’t have anywhere to keep towels by the sink, so instead of hanging a boring towel bar on the wall, I decided to build a ladder to hang our towels! How cool is that?? It takes up very little space and adds a ton of character. I just love it! 1) I picked up 2 – 6 foot 1 x 4 boards from the hardware store and one 6 foot 3/4″ dowel rod. 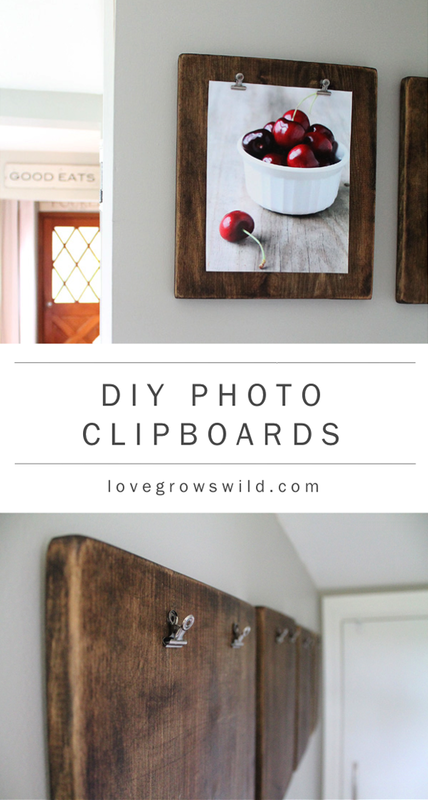 I sanded down all edges of the boards to give them a worn, rustic look. 2) I cut the dowel rod into 4 – 18″ pieces. 3) I laid all the pieces out to find the spacing I wanted for the ladder rungs and marked where each rung would go on the 1 x 4’s. I ended up spacing mine 14 1/2 inches apart. 4) Using a 3/4″ paddle bit, I drilled a shallow round in the 1 x 4’s for each of my rungs. *You only need to make a small groove for the dowel rod to set in. 5) I drilled long screws into one of the boards, securing the dowel rods in place. 6) Then I lined up the second board and screwed the other side of each dowel rod in place. 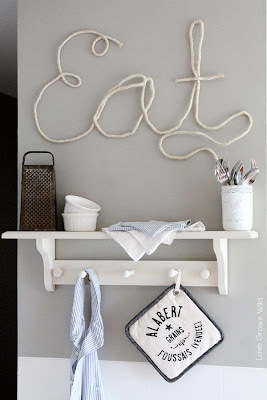 I am so smitten with this new addition to my pantry/kitchen makeover, and I love the charm it brings to the space! These shabby chic tea towels I created look stunning hanging from the ladder rungs. 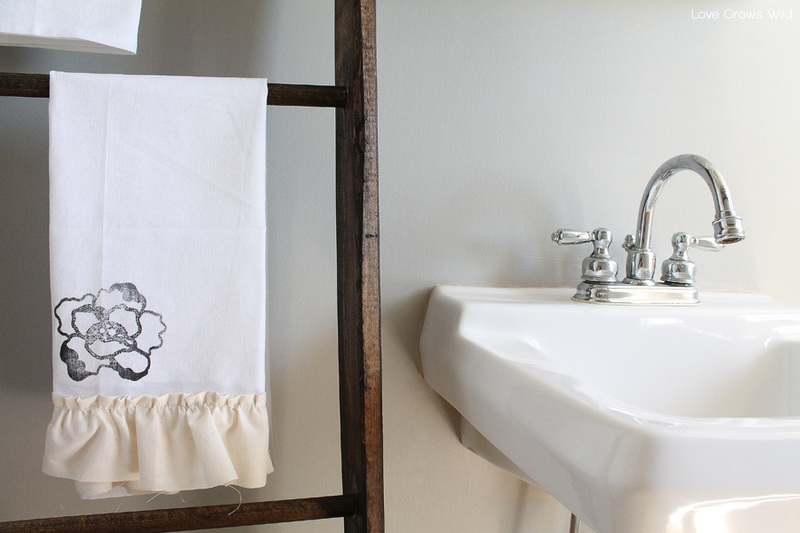 You can find the tutorial for the tea towels here! UPDATE: See this ladder used as blanket storage in our living room! Click here. So what do you think? Do you like unique storage ideas like this? What creative storage ideas do you use in your home? PREVIOUS: Now Accepting Contributor Applications! NEXT: Sale Alert: 25% Off All Silhouette Consumables! That’s so awesome! I’d never thought to MAKE a ladder–I’ve been keeping my eyes open for an old one, but this is fabulous! I have a ladder in my barn inspired bathroom to hold towels. It was the very first thing I moved in! I found it in an old building and displayed photos on it at my wedding so it’s kind of special to me! Nicely done! Love the stain color. It goes great with your gray walls. My sister has a ladder in her bathroom and I love how it looks! Thanks for the great tutorial! Ah! I’ve never liked a tutorial better than Jen’s before- until now! This is uh-mazing! I need one, you’ve made it sound irresistibly easy! I am really gonna follow the instruction those have been provided by you to me to make a DIY ladder at home. I really love the DIY stuff and quite excited to get this one created here. You seriously amaze me at the stuff you do! 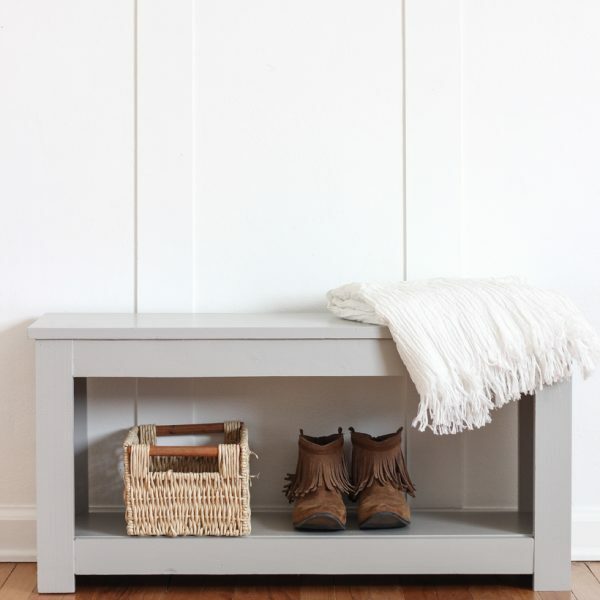 This is way too cute and is perfect for that little corner!!! What a great idea for hanging towels; love it! 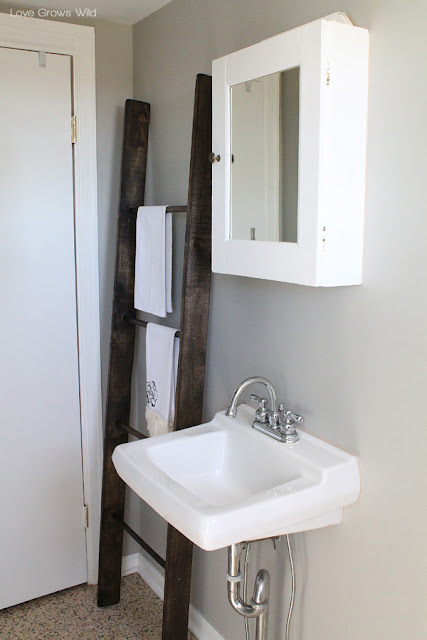 What a clever idea to use a ladder as towel holder! You did an amazing job with this ladder too! 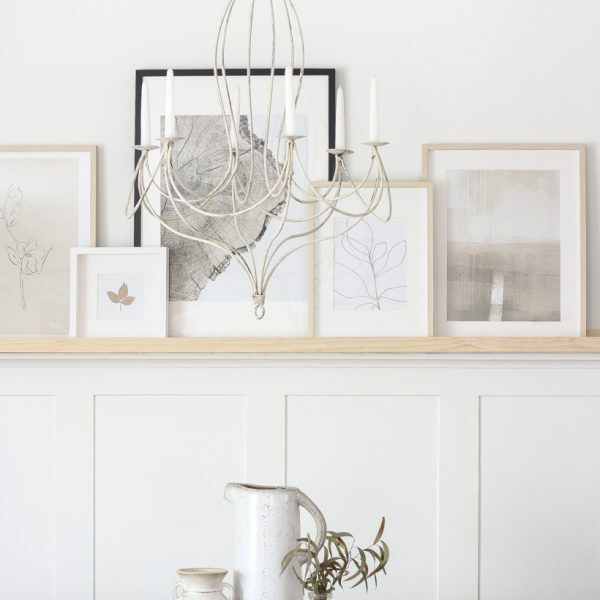 I love the look of ladders but had never thought of making one! This one looks great – thanks for the tutorial! I love the look of ladders but never thought of making one myself! This turned out great – thanks for the tutorial! Could you be any more AWESOME? I love this. I had an antique ladder that I used as a pot rack at our previous home…the buyers asked that we leave it and I’ve missed it ever since! I would have never thought to build one! How smart is this?!? Great job, friend!! My husband was just brainstorming making a ladder that starts wide and gets skinnier on top. I’ll have to show him yours and see if he can modify it. Looks great! pinning! i love the multi-purpose uses of a ladder in the house. soo gorgeous and cheap! you are fabulous! I love how the dark wood looks with the white pieces and the grey walls. Beautiful! Oh MY. I have been looking for a wooden ladder forever, and I never thought to make one!! Genius!! I would be so happy if you shared this on my weekend linky party! I just got done building this … and while I love the way it looks, I have not stained it yet as none of my test samples are coming out correctly. I wanted to ask you … what kind of wood did you use for this?? I am using red oak … please advise! thanks! Hey Ronny! I used pine boards, so the red oak will definitely change the look of the stain. What color stain are you using? I haven’t worked with red oak before, so I’m not sure the best advice to give! -how long did yours take to dry before you did the finishing wax? -Will the finishing wax help to seal in areas that are still not completely dry or should I wait before doing this step? -And how long after doing wax was it ready to put blankets on? Thank you so much for this tutorial it was so easy to follow and can’t wait for finished product! 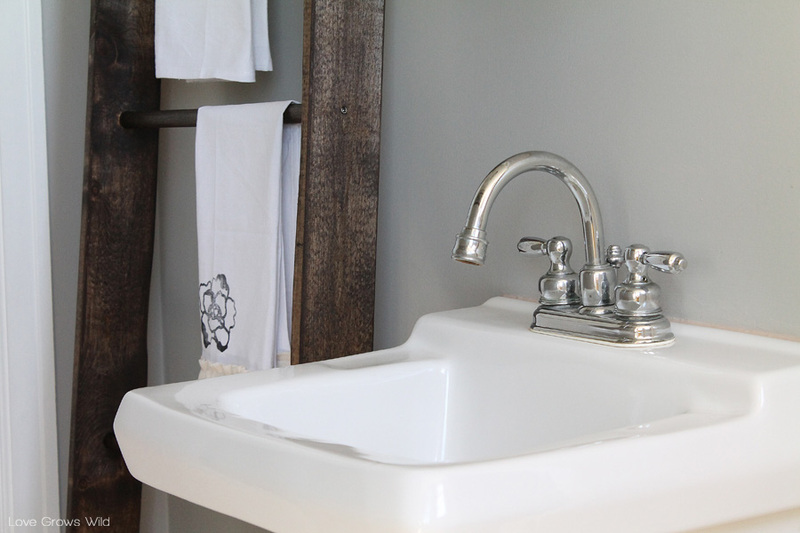 When applying the stain, let the stain set for about 5-15 minutes (depending on how dark you want the color to be), then wipe away any remaining stain that hasn’t soaked in yet with an old rag. I think the spots you’re describing that look still wet probably just needed a little wipe down. I usually let the stain dry for a couple hours, then come back with a finishing wax. The wax will definitely help seal in any of those trouble areas. I hope this helps!! Your mom is one lucky lady getting a handmade gift like this! I just came across this project- this is exactly what I’ve been looking for! When you sanded down the edges of the boards, did you use an electric sander or just sheets of paper? I don’t have an electric sander, so I’m curious if I should look in to getting one for this project. Hey Kaley! I have an electric sander, which is a HUGE help with larger projects like this. Sheets of sandpaper are fine for smaller projects, but if you use them a lot for projects I would definitely invest in a palm sander. You can find some that are relatively inexpensive and well worth the investment! I wanted to know how many coats of the dark walnut stain was used on the ladder, and also which Minwax Paste Finishing Wax was used? I have 2 containers of the Minwax, one is Natural and the other is Special Dark. Thanks! Can you tell me what kind of screws we’re used? We’re having trouble with the screws not going all the way through the dowel, causing the screw to show in between. Then the screw top keeps getting stripped. Any suggestions?